Increasing sun, lingering clouds with shower on South Shore of Massachusetts to Cape Cod. Highs 45-50 degrees. Overnight Wednesday: Cold and clear. Lows in the 20s. After another chilly start, the day will begin cloudy in southern New England with a few ocean-effect rain showers over the Cape. 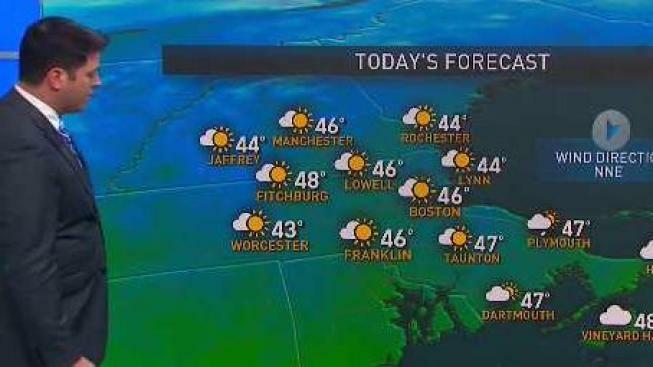 By the afternoon, emerging sunshine is expected with highs into the 40s. Quiet weather sticks around through Thursday before Friday brings the pool of cold air from the north-northwest after a cold front slides in, ushering in the coldest air of the season. It will be the coldest air since April Fool’s Day 2017 for most locations. Along that cold front, there is a possibility for some showers, some in the form of flurries into far northern New England late Thursday into early Friday. Highs Friday only reach into the upper 30s and that cold air sticks around for the first half of the weekend. At least high temperatures rebound into the 40s by the second half of the weekend. The weekend features plenty of sunshine Saturday, a few more clouds Sunday ahead of a chance for showers late Sunday into early Monday.